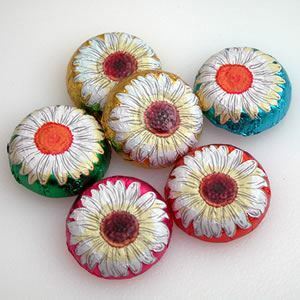 Milk Chocolate Foiled Daisies. Chocolate Store, the online candy store with chocolate and candy. Milk Chocolate Foiled Daisies – Our Daisies “don’t tell”, but if they did they would say that they are made of a creamy milk chocolate, and covered with colorful foil. About 1-1/2 inches in diameter. Approximately 60 pieces to a pound.